Hydrogen, with the lowest molecular mass, can diffuse more rapidly than other gases under similar conditions. Compare the rate of diffusion of hydrogen to that of oxygen under similar conditions. Therefore hydrogen diffuses four times as fast as oxygen. In dealing with the gas laws, a student must know what is meant by standard conditions of temperature and pressure (abbreviated as STP). The standard pressure is defined as the height of mercury that can be held in an evacuated tube by 1 atmosphere of pressure (14.7 lb/in.2). This is usually expressed as 760 millimeters of Hg or 101.3 pascals. Standard temperature is defined as 273 Kelvin or absolute (which corresponds to 0° Celsius). Graphic relationship - Charles’s Law. The dashed lines represent extrapolation of the data into regions where the gas would become liquid or solid. Extrapolation shows that each gas, if it remained gaseous, would reach zero volume at 0 K or -273°C. A sample of gas occupies 24 L at 175.0 K. What volume would the gas occupy at 400.0 K? The final volume has increased as predicted. Given the volume of a gas as 200. mL at 1.05 atm pressure, calculate the volume of the same gas at 1.01 atm. Temperature is held constant. The gas in a balloon has a volume of 7.5 L at 100. kPa. The balloon is released into the atmo­sphere, and the gas in it expands to a volume of 11. L. Assuming a constant temperature, what is the pressure on the balloon at the new volume? The final pressure has decreased as predicted. 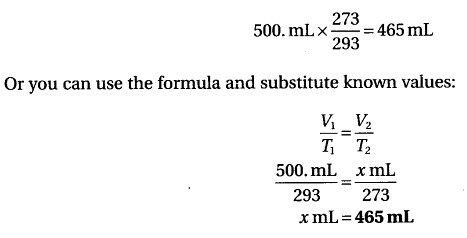 The volume of a gas at 780. mm pressure and 30.°C is 500. mL What volume would the gas occupy at STP? The volume of a gas is 27.5 mL at 22.0°C and 0.974 atm. What will the volume be at 15.0°C and 0.993 atm? A steel tank contains a gas at 27°C and a pressure of 12.0 atms. Determine the gas pressure when the tank is heated to 100.°C. At 120.°C, the pressure of a sample of nitrogen is 1.07 atm. What will the pressure be at 205°C, assuming constant volume? A mixture of gases at 760. mm Hg pressure contains 65.0% nitrogen, 15.0% oxygen, and 20.0% carbon dioxide by volume. What is the partial pressure of each gas? CORRECTION OF PRESSURE WHEN A GAS IS COLLECTED OVER WATER. When a gas is collected over a volatile liquid, such as water, some of the water vapor is present in the gas and con¬tributes to the total pressure. Assuming that the gas is saturated with water vapor at the given temperature, you can find the partial pressure due to the water vapor in a table of such water vapor values. This vapor pressure, which depends only on the temperature, must be subtracted from the total pressure to find the partial pressure of the gas being measured. (1) When the level inside is higher than the level outside the tube, the pressure on the inside is less, by the height of fluid in excess, than the outside pressure. If the fluid is mercury, you simply subtract the difference from the outside pressure reading (also in height of mercury and in the same units) to get the corrected pressure of the gas. If the fluid is water, you must first convert the difference to an equivalent height of mercury by dividing the difference by 13.6 (since mercury is 13.6 times as heavy as water, the height expressed in terms of Hg will be 1 /13.6 the height of water). This is shown pictorially in Figure 21. Again, care must be taken that this equivalent height of mercury is in the same units as the expression for the outside pressure before it is subtracted to obtain the corrected pressure for the gas in the eudiometer. (2) When the level inside is lower them the level outside the tube, a correction must be added to the outside pressure. If the difference in height between the inside and the outside is expressed in terms of water, you must take 1/13.6 of this quantity to correct it to millimeters of mercury. This quantity is then added to the expression of the outside pressure, which must also be in millimeters of mercury. If the tube contains mercury, then the difference between the inside and outside levels is merely added to the outside pressure to get the corrected pressure for the enclosed gas. Hydrogen gas was collected in a eudiometer tube over water. It was impossible to level the outside water with that in the tube, so the water level inside the tube was 40.8 mm higher than that outside. The barometric pressure was 730. mm of Hg. The water vapor pressure at the room temperature of 29°C was found in a handbook to be 30.0 mm. What is the pressure of the dry hydrogen? STEP 2 Correcting for the partial pressure due to water vapor in the hydrogen, we subtract the vapor pressure (30.0 mm) from 727 mm and get our answer: 697 mm. P, V, and T retain their usual meanings, but n stands for the number of moles of the gas and R represents the ideal gas constant. Boyle’s Law and Charles’s Law are actually derived from the Ideal Gas Law. Boyle’s Law applies when the number of moles and the temperature of the gas are constant. Then in PV = nRT, the number of moles, n, is constant; the gas constant (R) remains the same; and by definition Tis constant. Therefore, PV= k. At the initial set of conditions of a problem, P1V1 = a. constant (fc). At the second set of conditions, the terms on the right side of the equa¬tion are equal to the same constant, so P1V1 = P2V2 This matches the Boyle’s Law equation introduced earlier. 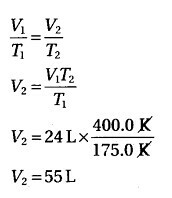 To use the Ideal Gas Law in the form PV = nRT, the gas constant, R, must be determined. This can be done mathematically as shown in the following example. One mole of oxygen gas was collected in the laboratory at a temperature of 24.0°C and a pressure of exactly 1 atmosphere. The volume was 24.38 liters. Find the value of R.
Once R is known, the Ideal Gas Law can be used to find any of the variables, given the other three. For example, calculate the pressure, at 16.0°C, of 1.00 gram of hydrogen gas occupying 2.54 liters. Another use of the ideal gas law is to find the number of moles of a gas when P, T, and V are known. For example, how many moles of nitrogen gas are in 0.38 liter of gas at 0°C and 0.50 atm pressure? pressures below a few atmospheres will cause most gases to exhibit sufficiently ideal properties for the application of the gas laws with a reliability of a few percent or better. tions will be less than those predicted by the Ideal Gas Law, where PV remains a constant. gas situation. Thus, under conditions of very high pressures and low temperatures, deviations from the expected results of the Ideal Gas Law will occur.